I have been plugging away at the Hanne cape. I passed the 1/2 way mark a few days ago, but the photos would not look substantially different, so I won’t bore anyone with a repeat. I have also been spinning away, I find the spinning even more meditative than knitting. It is just taking away from my knitting time, and creating more yarn in my stash. I started reorganizing my knitting room by placing most of my books in the glass fronted cabinet. I won’t have photos to show for a while, as we still have to have some work redone on the drainage system, most notably they are ripping up and replacing the section of concrete that was badly placed. What I thought was a 2 week project will be a 7 month or more issue. We did get it back in order for this week with some wonderful old friends, college roommates coming together. Only to pack part of it up again. So, I have not seen much of my yarn for months. I am sure that it will be a surprise when it resurfaces in a few weeks. I do need to pull out the Baby Ull, as I have a baby gift that needs to be knit up. More yarn for my sock clubs came in the mail. I am behind on knitting these up. The Tour de Fleece really got in the way, then a lot of work around the house. Here is the yarn that came in the mail yesterday. From the CookieA sock club. 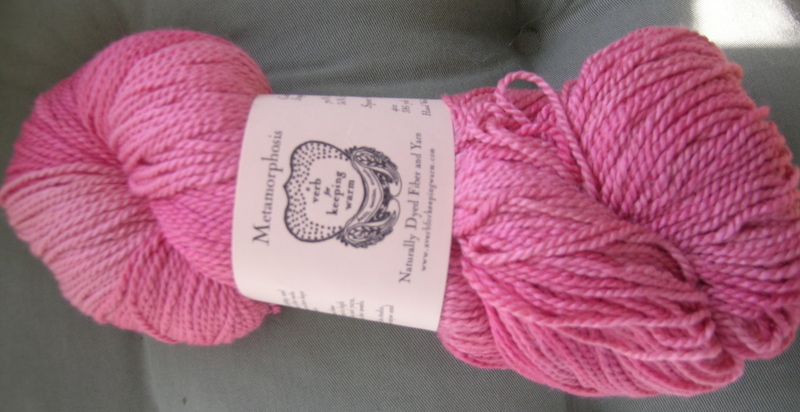 I love the color, it is a sport weight which is heavier than I usually use for sock yarn. The yarn is Metamorphosis from A Verb for Keeping Warm, color Sugar Jets, 70% superwash merino, 30% silk. I have been reading a lot about this company, and it will be fun to try their yarn. 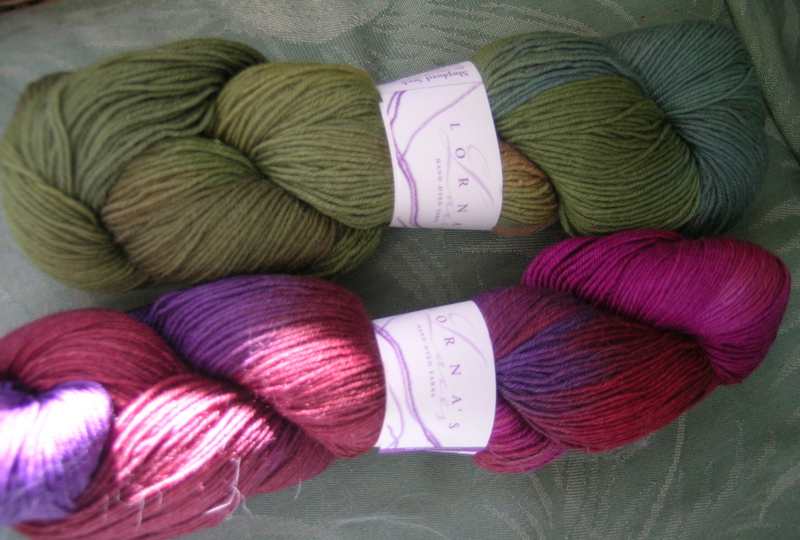 And for the Janel Laidman Illuminations club, 2 skeins of Lorna’s Laces Shepherd sock yarn. Colors: Valentine and Fiddlehead. I think these will be very interesting knit together. I love these sock clubs, as I am having the chance to try out a lot of different yarns, and yarns that are not readily available to me for the most part. 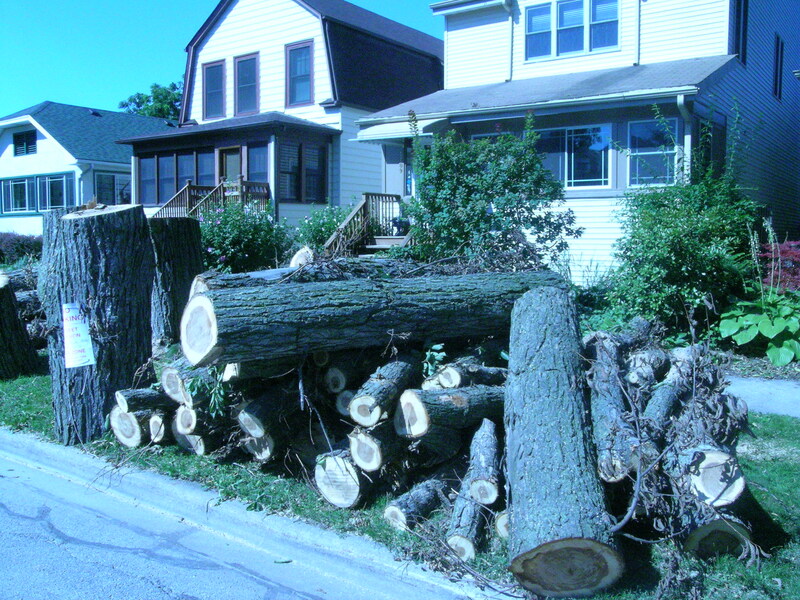 Yesterday my neighbor’s formerly majestic Elm came down. It has been dead all summer, Dutch Elm disease. They let these trees go too long and I am worried about the one in front of my house. Both of them were severely damaged 2 years ago when the tree across the street cam down on them and our front porches. My landscaper was here in the afternoon expanding the natural garden to take advantage of the sunshine. I will miss my shade.